Welcome to the Full-Time FBA group! In this group, we’ll talk about what it takes to turn part time hours into a full-time income with Amazon FBA! The purpose of this Facebook group is to create a positive and uplifting community of people who are interested in selling on Amazon and turning part-time hours into a full-time income via Amazon FBA. We like nice people – Feel free to ask and answer questions, but please do so in a respectful and encouraging manner. Sarcasm and/or insults will not be tolerated and will be grounds for removal from the group. If you have an issue with someone and feel the need to confront them, then please do so in a private message. We like people who ask questions – Whether you are a newbie or a seasoned veteran, you’ll have a time where you will want to ask a question. We love questions, but before you ask we suggest doing a quick search in the search bar to see if someone has already talked about your question. You can get your answers much faster that way. We like people who share – We know everyone has their own unique situation when it comes to selling on Amazon, and we’d love to hear your point of view on the topics brought up in the group. Feel free to share your experiences, advice, and stories in a way that can help others. Do not solicit people to contact you privately. NOTE: If you have a link or video to share, do this instead: Summarize the main points in the video or link and post that in the group. Only approved promotions are allowed – We don’t mind promoting products, books, services, tools, etc that we personally have experience with, so be sure to ask permission of one of the admins before posting anything resembling a promotional post. This includes any posts you may have asking about or giving reviews of any non-Full-Time FBA products. Any unapproved promotional posts (be it obvious or subtle) will be deleted. Let’s stay focused – We love our community members, but let’s keep all posts focused on things that are related to online selling, and keep any personal posts on your personal Facebook page. No reviews – While I’m sure your product is probably great, this group is not a place to seek product reviews. No Facebook live videos – We all love videos, but please no Facebook live videos without admin approval. No Full-Time FBA support – If you’re having an issue with any of our products or services, the fastest way to get support is by sending an email (stephen@fulltimefba.com) or private message. Any violation of the above guidelines will result in the deletion of the post/comment and possible immediate removal and ban from the group. Overall, the purpose of these guidelines is to provide you with the best possible community to help you in your Amazon FBA journey. We don't have wiki content for Full-time FBA ( Facebook Group ) yet. Are you familiar with Full-time FBA ( Facebook Group )? 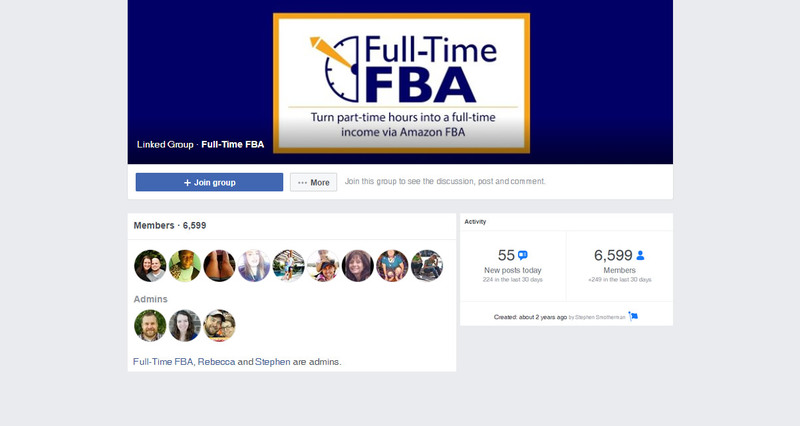 Please quickly share in your own words what Full-time FBA ( Facebook Group ) is all about! Share in your own words what Full-time FBA ( Facebook Group ) is all about.